The National Buffalo Museum and bison herd are located at the Frontier Village, near the intersection of Highway 281 and Interstate 94 (exit 258). Museum exhibits focus primarily on the history of bison in the plains culture, but offer something for every interest. Displays include Plains Indian artifacts; a wide variety of artwork; the 19th century firearms used by bison hunters; remains of prehistoric bison; a children’s room featuring wildlife of North Dakota; and video presentation about the history of bison. The machine is in the museum/gift shop main room. 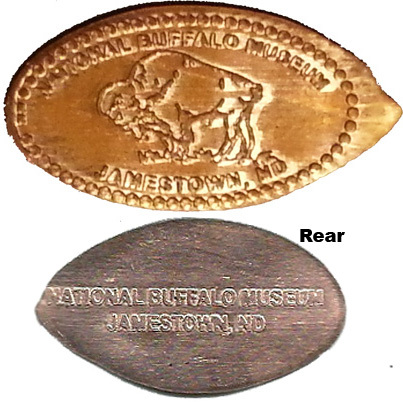 Single design ia a Buffalo/ Bison. thegillion added National Buffalo Museum to system.